You can find amazing and useful apps in your local app store, but you aren’t likely to find enterprise mobile solutions. Most apps you download are just that, single apps that perform a specific function. These don’t work with the other apps on your mobile device and don’t provide a suite of services. 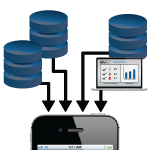 Enterprise mobile applications are different. They are designed to provide a suite of services, perform multiple functions for an organization in a coordinated fashion. SBN created mobile enterprise software for organizations to manage field work performed within their Operations/Facilities and Environment, Health and Safety programs. 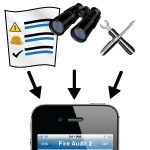 Our enterprise mobile solutions allow organizations to create and document any type of field inspection or audit or any type of field procedure (e.g., lockout tagout, permit-required confined space entry, HVAC maintenance) on a mobile device right in the field. You are also able to schedule activities and monitor progress in real time. Although we created our solution with EHS professionals in mind, our solutions are robust and adaptable, and it can be used by any professional who needs to collect information while they are working out in the field. As an enterprise solution, it is also easily scalable from one location to multiple locations spread around the globe.